In this post we have a Texas HUD Home at 6326 Peace Pipe Dr., San Antonio, TX, 78238. This is an interesting 3 bedroom 3 bath home that could potentially be a 6 bedroom home if you finish out the addition that was put on the back of it. It is definitely a fixer upper and investor special, but it is price about $36,000 BELOW the county appraisal. It is about 2,500 square feet and was built in 1963. As you’ll see from the video it is going to need a full make over. It is currently listed for $110,000 and HUD will pay 3% of your closing costs. There have been some tremendous savings on HUD Homes lately so if you are looking for a home to live in or some houses to pick up as an investor, now is the time to buy. All HUD Homes are time sensitive so you need to call me as soon as possible to discuss your buying options. Did you know that on some HUD Homes, HUD will loan you money to do repairs? Take a look at the video and see what you think, or search my webpage for other Texas HUD homes in your area. It’s as easy as entering a Zip code in the “Search Site” space on the website. FHA Case# 495-444564. 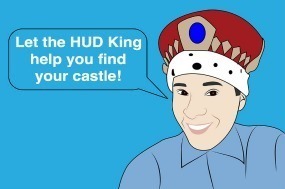 Next → Next post: Cheap HUD Homes – HUD King tours 512 Stratford Ct.